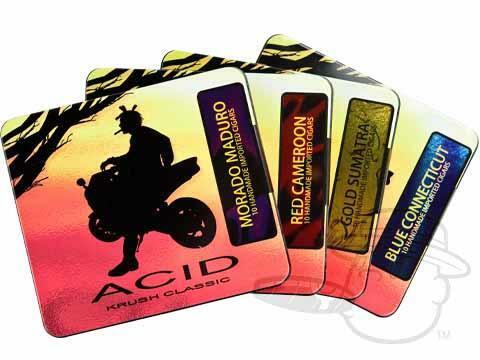 Take a trip through the wild flavor infusions of Acid Cigars with the Acid Krush Tins Sampler. Showcasing four outrageously unique Acid blends in convenient 10-count tins, this collection of handmade 4x32 cigarillos will take your taste-buds to a new dimension of flavor, Drew Estate-style. Contains one tin of each: Acid Krush Blue Connecticut, Acid Krush Gold Sumatra, Acid Krush Morado Maduro, Acid Krush Red Cameroon. Great way to try several different Acid cigars. Used this to determine which of the larger size to purchase. Great way to enjoy my favorite Acids! Love the tins the size of the smoke is perfect & the there is not a bad smoke in the variety pack!!! Acid Krush Tins Sampler is rated 4.9 out of 5 based on 11 customer ratings.